Need a Nutrition Boost? 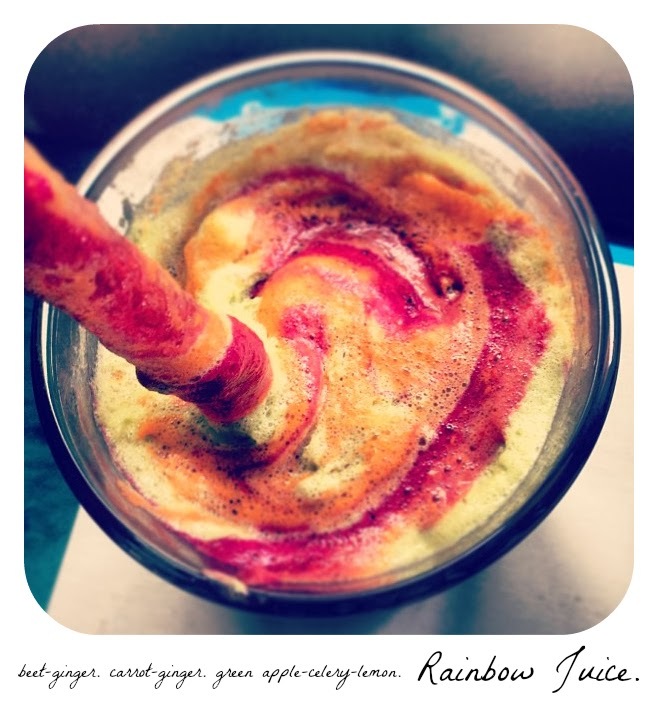 Sip on this: Rainbow Juice! + Half Day Juicing. Frothy swirls of pink, gold and green greet you in a frosty glass. One sip from a cool glass straw and those vibrant spicy-sweet flavors hit your palate and send your taste buds dancing in bliss. Sipping these sassy flavors will energize your day and fuel you with nutrients. And before you know it, you have chugged your Rainbow Juice. Most of you know me as the smoothie girl. And while I certainly get my fill of blended bliss smoothies each week, there is another wellness practice I adore: juicing! I haven't done a juicing post in quite a while so here it goes. 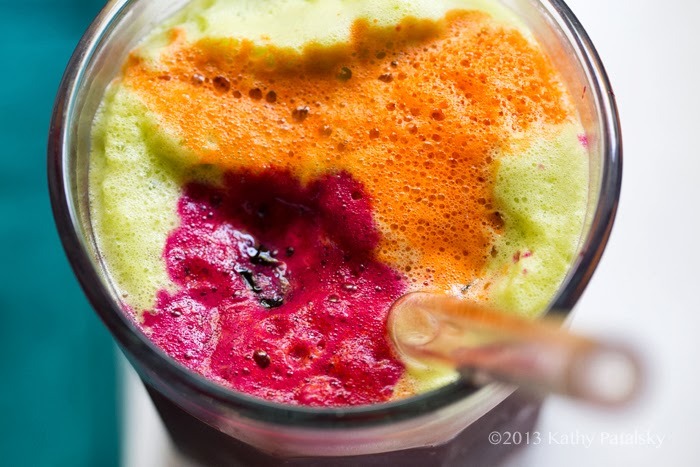 Today I'm sharing three favorite juicing recipes, what their health benefits are and how I merge them into my Rainbow Juice blend. 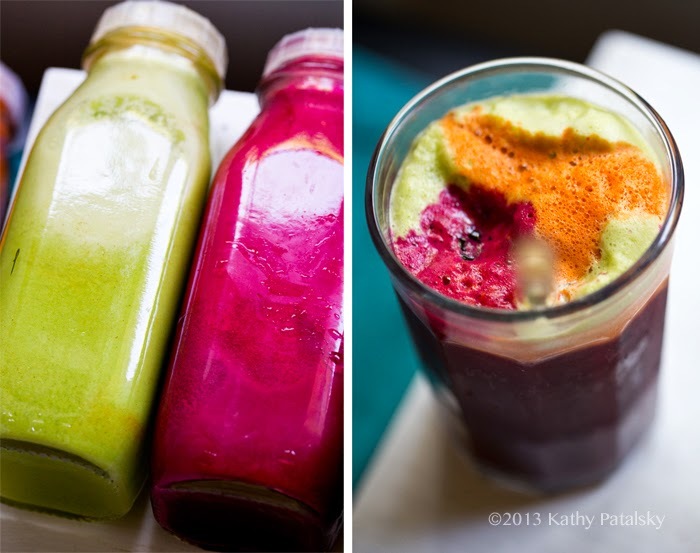 Plus find out how you can try one of my favorite wellness habits: a half day juice cleanse!.. Rainbow Juice. Three blends, one glass. 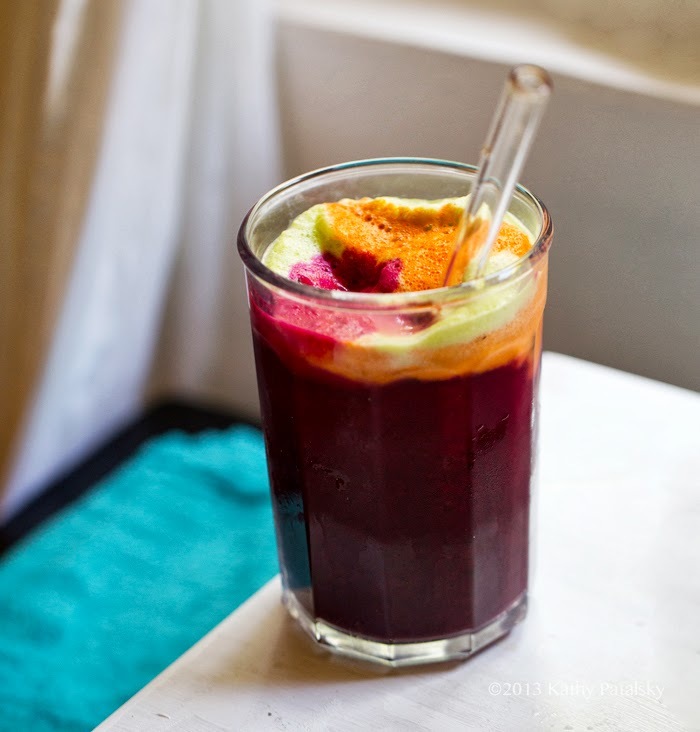 Rainbow Juice Recipe: 1/3 beet/ginger juice + 1/3 carrot/ginger juice + 1/3 green apple-celery-lemon-ginger-cayenne juice. Swirl well. Add splashes of coconut water to make the flavor less bold (if desired). Serve over purified water ice cubes. Serve with a glass straw if you have one. For me, juice fasting beyond 1-2 full days is not really for me. I have no doubt that there are benefits - especially for people who may not eat a clean diet. But since I generally eat a clean, healthy diet - that is always vegan/plant-based. Juicing on a more moderate level suites me more. But obviously from this post: I LOVE JUICING. I love one juice in the morning or as an afternoon pick-me-up or I even love adding fresh pressed juice (like carrot juice) as a liquid base in smoothies. 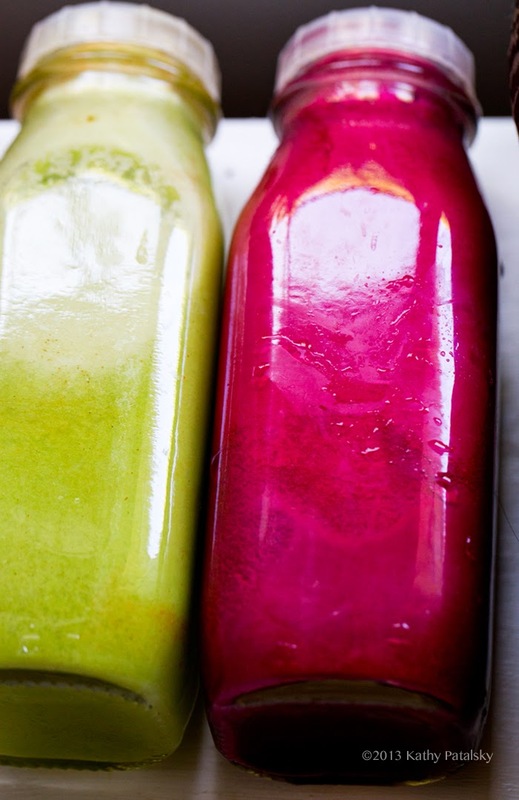 I also love my own style of juice fasting as a weekly or bi-weekly wellness habit. So, what works for me? I call my juicing habit a half day cleanse. (Full details + how-to below!) These are the ingredients I use in my Rainbow Juice as part of my cleanse..
Beet - Beets blend up looking beautiful. Dark "rosy cheeks, red lips" pink! Beauty-food beets. Fresh, raw beet juice is a deep purple-red color. Beet juice is very sweet and actually very light and appealing despite what pre connotations people may have about beets. Most people have only tasted roasted or cooked beets which have quite a different more woody, earthy flavor. Raw beets are similar to carrots in a way! I always say that it would be what vampires would chug if they were vegan :) Beets are well known to be a blood strengthener. Beet juice contains vitamin C, a large amount of folate, vitamin B6, thiamin, riboflavin and a hefty amount of minerals including potassium, iron, calcium, magnesium, manganese, phosphorus, zinc, copper and a hint of selenium. Talk about a power-packed superfood! Tip: If you are new to beet juice start off by adding just a splash to your juice blends. Once you acquire a taste for this sweet juice and how it makes you feel, you will probably crave it! Carrot - Carrots juice up super sweet and almost creamy in a lovely desirable way. Carrot pairs perfectly with ginger. (It also goes well with coconut! Fresh raw coconut meat or coconut water.) Carrot also tastes amazing served over ice with a splash of fresh orange juice. Carrot juice is quite sweet, so be aware of that when you drink it if you are sensitive to sugars (even natural ones!) Carrot is famously rich in vitamin A. It also contains thiamin, niacin, vitamin B6, folate, manganese, vitamin C and potassium. Ginger - Warming, spicy and very stimulating. Ginger is also well known for its digestion enhancing properties and may even help with nausea or an upset stomach. I adore adding heaps of ginger to my juices. It really sharpens and tones all the other fruit and veggie flavors in the blend. Green Apple - I love juicing green apples due to their tart perky flavor and vibrant sweetness. Apples contain vitamins A, C, B6, K, potassium, copper, magnesium, manganese and even a hint of iron, calcium, phosphorus and more. Celery - This low sugar, mildly flavored veggie juices like a dream due to its high water content. Celery juice contains potassium, vitamin A, vitamin C, vitamin K, folate, riboflavin, calcium and magnesium. Cayenne - Spicy, stimulating and warming, cayenne helps to perk up your system and provide a spicy accent. Some studies have even shown that spicy foods helps boost your metabolism temporarily. Coconut Water - Rich in electrolytes including potassium, coconut water is a low calorie, sweet tasting beverage that comes from fresh/raw young green coconuts. Coconut water is a great source of magnesium, manganese and more. You can buy coconut water at most grocery stores. If you can find whole coconuts with the tops cut off, go for those! Kathy's Half Day Juice Cleanse. Remember those "half days" back in school? They were always super awesome, yes? Home by lunchtime and ready for some sunshine or lounge time or a few hours to get ahead on schoolwork. Well a half day juice cleanse is kinda like that! You were expecting a lengthy full day of juicing, but surprise! you can get some pretty effective results in my half-day model. Actual "half" day depends on how you look at it because the numbers show your body gets just under a full 24 hours of digestion resting + juice cleansing!.. I do this once every week because it makes me feel amazing and I really actually enjoy it. As opposed to the overnight/multi-day juice fasts. I like that I am flushing my body with nutrient-dense juice for a good 16-20 hours. (If my last meal was at 9pm the day before and I juice fast until 4pm the next day that is a good 19 hours!) During that time I am letting my digestive system rest (which is one of the benefits of longer term juice fasts.) Even in my half day cleanse I can feel a difference and notice my body detoxing on a moderate level. Along with the juice, I am sure to drink plenty of alkaline water throughout the day and I also include my Goji-Berry Lemon Cayenne Maple Tea (only I strain the berries instead of chewing them). So here is how to do it..
*tip: always try to use organic produce when juicing. 3-4 16oz. glass bottles for storing your juice for the day. (If you do not have bottles, you can use large glasses and secure with some plastic wrap. Step 1: Upon rising. Drink a small glass of lemon water or my lemon tea. This will warm and wake your digestive system a bit. Step 2: Start juicing for the day. First juice carrots + 1 Tbsp of ginger. Keep juicing your carrots until you get about 16 ounces of carrot ginger juice. Pour the carrot juice into bottles. Step 3: Juice your beets also with ginger. Pour into a bottle. Step 4: Juice 1 green apple + 1 bunch of celery (or cucumbers) + ginger and add 1 lemon (squeezed not juiced). Pour into a bottle. Tip: Add ginger + cayenne (and lemon!) to taste for all blends! You may want super spicy juice or just moderately spicy juice. You can add lemon juice to any blend you'd like if desired. Step 6: Drink 12+ ounces of rainbow juice (or separate flavors) every 2 hours (or when ever you want more - just be sure to ration your juice so you do not run out.) Drink water and/or coconut water between juices. If you get hungry for some chew foods, munch on a few Brazil nuts (selenium!) or a brown rice cake. You could also munch a few walnuts or eat a spoonful of almond or peanut butter. Step 7: Be sure to clean your juicer after juicing! Store bottles in the fridge, sealed to reduce oxygen. Step 8: So, if you wake at 9am and drink your first juice at 10am, your second juice will be at noon and you third at around 2pm. And your last juice should be around 3 or 4pm. This way you will be ready to enjoy a healthy vegan dinner by around 6-7pm. If you are hungry around 4pm you can eat a light snack to tide you over until dinner time. Some rice cakes with almond butter and banana, or maybe a smoothie to continue your easy digestion mode! Actually, a smoothie is a perfect way to break a juice fast because while it contains fiber, it eases you back into fiber by letting you consume it in a processed, liquid state! And congrats! You completed a juice cleanse! -> More greens: add a handful of your favorite greens like spinach, kale or chard to any of your juices. -> More sweet: try adding more apple to your juices - although beet and carrot are also very sweet. You can also try adding orange, grapes, pear or pineapple! So many "sweet" healthy options for juicing. 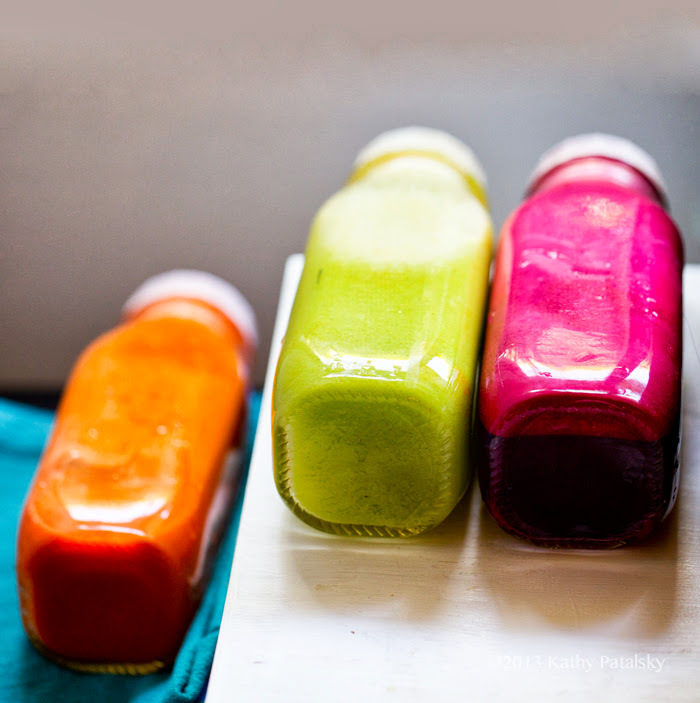 -> Less sweet: You can always modify you juice by using more neutral ingredients like cucumber and celery. These high water content, low sugar content ingredients will turn down the sweet flavor. You can also add purified water to any juice blend to further reduce the sweet. -> More spice: Add more ginger and cayenne. Adventurous juicers can even add a clove of raw garlic! Tools: Juicer - Yup, you do need a juicer to juice. Here are three that I have owned and love..
SuperAngel - such DRY pulp! There is so little pulp with this machine that you really do not waste much food unlike most juicers where you feel like you have so much pulp/fiber left. I bought this juicer as a big investment purchase about four years ago and this juicer is still one of my favorite appliances. Breville Compact - Perfect for small spaces. This juicer takes up a small amount of counter space and juices super fast. Downside: a lot of wet pulp, but if you find ways to use the pulp, that is helpful. This juicer is best for hard produce (carrots, apples, beets..) Love the wide mouth. Breville Multi-Speed - a bit more versatile since you can do a lower speed than the compact one speed. A bit better with leafy greens than a one speed/high speed juicer. 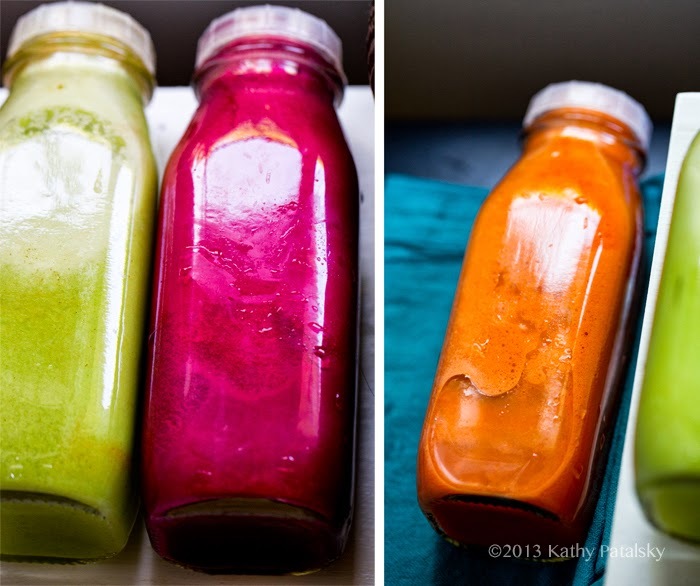 What are your favorite juicing recipes, tools and tips?? Here are a few more juicing recipes of mine..
Oh and soon I will post a few recipes for using up juicer pulp! 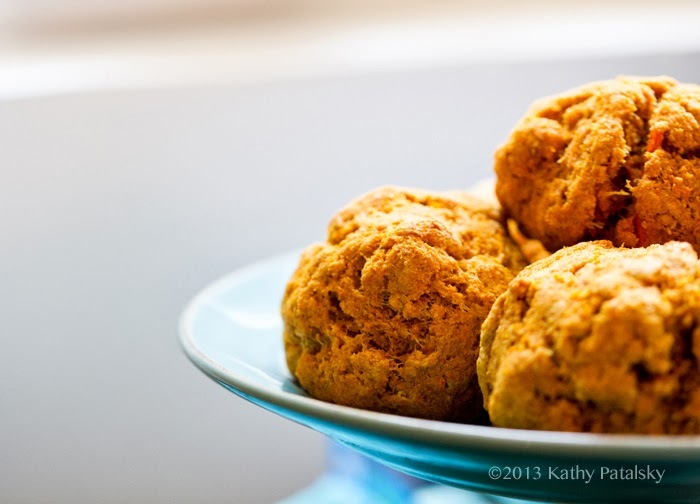 Sneak peek, carrot biscuits..